When it comes to improving human nutrition and family income, few livestock production endeavors can beat dairy production. 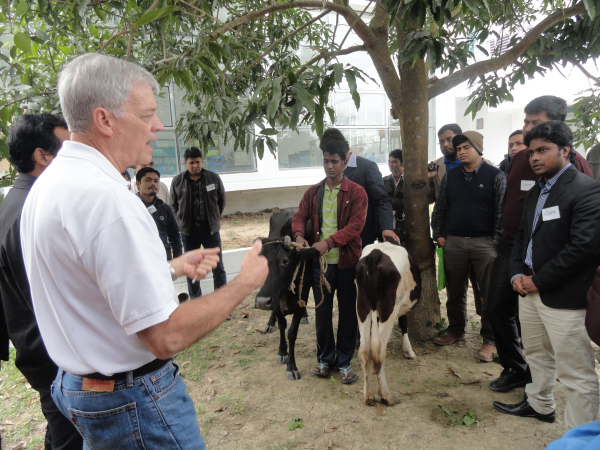 However, when it comes to dairy production in Bangladesh, there is competition between the land to grow food for the human population and that for feedstuffs that satisfy the requirements of dairy animals. This was the primary challenge that I experienced from the Winrock volunteer training program for NGOs and national production agencies involved in dairy programming. 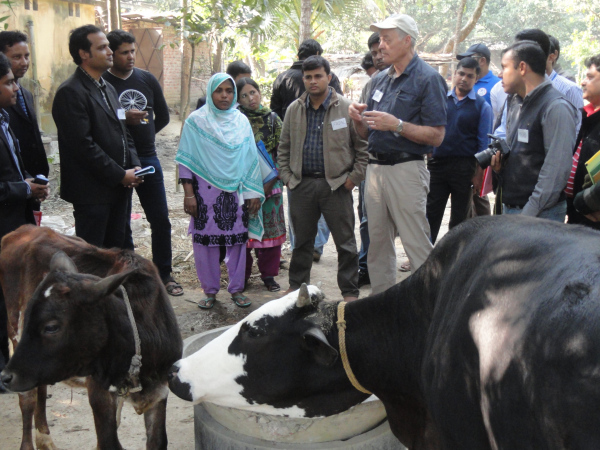 I was delighted to get an assignment with Winrock’s USAID-funded Farmer-to-Farmer program to support the work of Heifer International Bangladesh with a Training of Trainers program on Improving Dairy Cow Health Management with veterinarians and livestock agriculture workers from organizations such as Solidaridad, CARE, Land O’Lakes, BRAC Dairy, and ACI Animal Health. Animal Health training encompasses a well-rounded set of disciplines such as animal nutrition, animal reproduction, animal husbandry, animals and the environment and animal welfare / humane slaughter, along with an understanding of disease diagnosis, treatment and surveillance. That outline provided the template for about two weeks of classroom and field trips for 28 of us in the area around the city of Rajshahi, along the Padma River in the northern section of the country. With the nutritious benefit provided by milk comes the great requirement for feedstuffs and improved management. Crops cover the Bangladesh landscape from border to border and the sea to the hills. There is hardly any piece of ground that goes unused and most of that is for homes and business with the rest in production for market crops. Where is the land to produce crops and by-products for the cows? The knowledge already in place in the participant’s past education and experience from their field work helped to make our training task more productive. We took time to get to the field to see the real situation in production farms and to have hands-on discussions about the right approach to improved animal management. The challenge is great in finding ways to improve dairy production in a country that needs its land to feed 150 million population. Our workshop will help to make that happen. 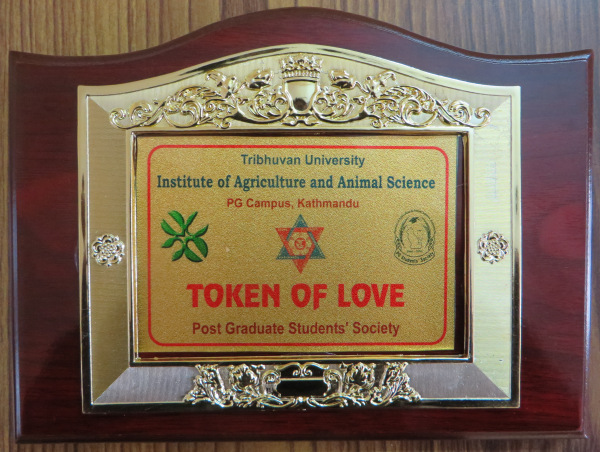 “At the end of my first class at Tribhuvan University’s Institute of Agriculture and Animal Science, I was rewarded with a plaque from the student organization as a Token of Love. At first I smiled at the quirky expression of appreciation, but soon I thought more deeply.